Your family will love this easy to make recipe for Crock-Pot Beef Stroganoff (with gluten free options). Not only is this super simple to make, it also has no “cream of whatever” soup in it like you will find in many slow cooker recipes for beef stroganoff. 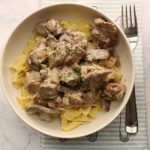 My family loves beef stroganoff and when this recipe is prepared in the slow cooker the meat turns out super tender and the sauce, just awesome flavor! The sour cream and dill just bring a great punch of flavor and the tender beef and mushrooms are my favorite part. I like to serve beef stroganoff over egg noodles because to me, that is the classic way to serve it. But you can also serve it over rice or even mashed potatoes. If you are on a low carb diet, skip the starch and just eat the recipe as is. It is super tasty and if there are leftovers they make a great lunch for the next day! 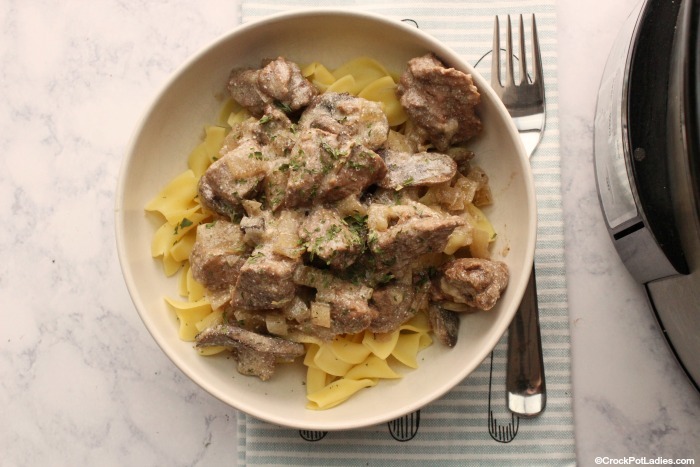 The beef comes out super tender in this delicious recipe for beef stroganoff cooked in your slow cooker. Serve the beef and sour cream based sauce over egg noodles for a great dinner the whole family will love. In a 6 quart or larger slow cooker add beef stew meat, beef broth, Worcestershire sauce, mushrooms, onion, garlic, salt, pepper and dill. Stir to combine. Remove lid from slow cooker and add sour cream and Dijon mustard and stir well to mix. Next, sprinkle xanthan gum on top of the sauce and allow 5-10 minutes to thicken. Stir and serve over cooked egg noodles (gluten free if you're on a GF diet), rice or mashed potatoes. The nutritional information in this recipe was calculated with the recipe as written and does not include any egg noodles, rice or mashed potatoes that you may opt to serve the beef stroganoff over. As the meat cooks it will release some juices. I need low sodium recipes for crockpot pot. The link to this recipe in on the low sodium page, although it is clearly not low sodium as printed. Do you have a low sodium version? Hi Amy, this recipe comes in at 410mg of sodium per serving. We define low sodium recipes as being under 480 mg of sodium per serving. Because you know your dietary needs better than we can possibly ever know we of course want you to use your best judgement in order to meet your needs. The ingredients listed on your recipe Crock Pot Beef Stroganoff on YUMMLY are TOTALLY DIFFERENT than your ingredients listed in the directions. What is up with that? I don’t know Barbara. We don’t control Yummly at all and not sure what they have listed over there. You may want to try contacting the folks at Yummly and asking them why it is different because as far as I can tell they are supposed to pull exactly what we have listed on our site. But since they are a third party service we don’t have any control over it at all. What does the red wine vinegar do the recipe? This is not something I would have on hand and would prefer not to buy a whole bottle for the little the recipe calls for. Red wine vinegar in this recipe adds a touch of brightness to the dish. If you don’t have any on hand you can use a little apple cider or distilled white vinegar or you can omit it. It appears your instructions are out of order and cooking times are reversed. Thanks Kathy for pointing out my error. I have fixed the recipe with the correct cooking time and removed the errant instruction that had serving of the beef stroganoff over noodles right in the middle of the recipe. I am sorry about that but really appreciate that you took the time to notify me. Yum! 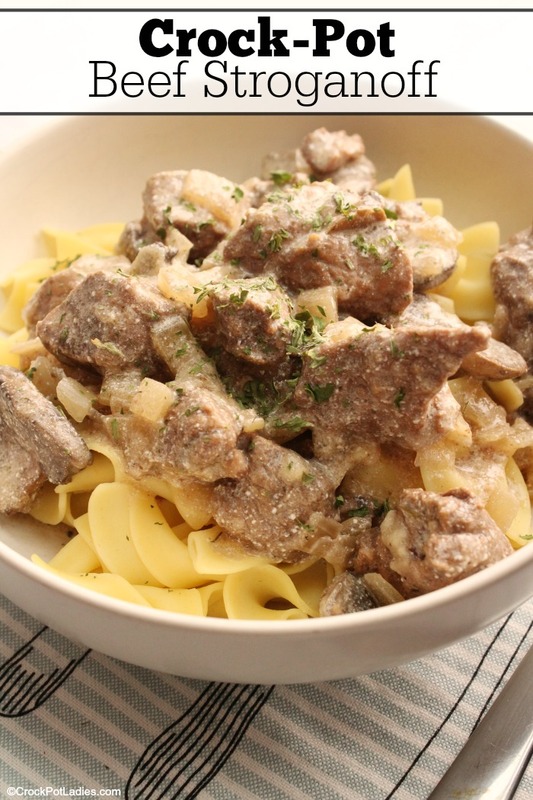 I love stroganoff and I love how easy this is thanks to the crockpot! Definitely needs to go on my menu! Thanks Lydia, I hope you enjoy the recipe!